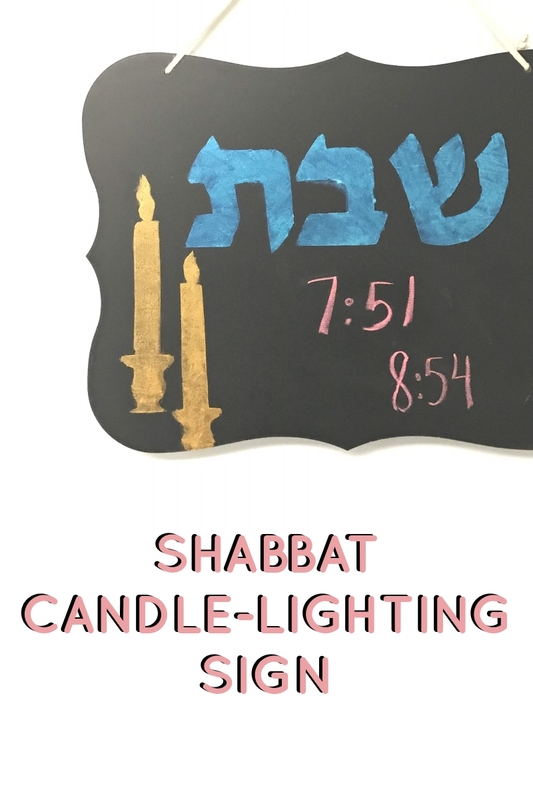 I love useful crafts, and I created this Shabbat Candle-Lighting Sign for a very specific reason. Much like Menucha’s Light Switch Covers, this craft not only looks fantastic when displayed, it also serves a purpose. Disclosure: this post contains commissioned links and images. 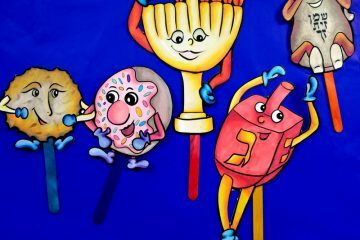 Every week, without fail, I find myself frantically searching for my calendar to determine what time Shabbat starts and ends. 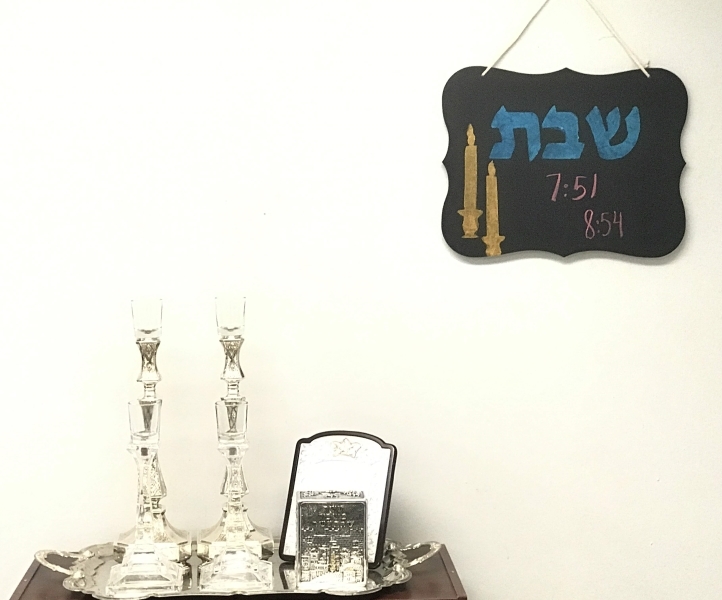 I check multiple times before Shabbat, because I never remember, and then as it nears the end of Shabbat, I start to check again. 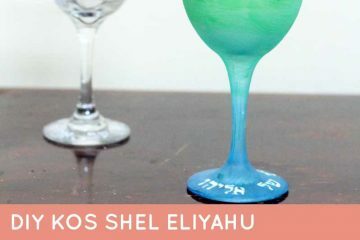 Sometimes, I don’t have a calendar on hand and check online, which I obviously can’t do on Shabbat. 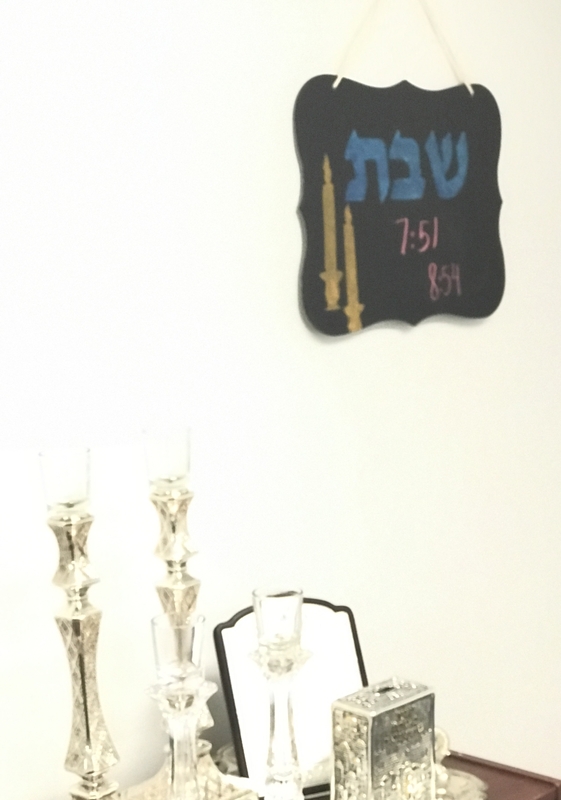 I wanted a way to display Shabbat candle-lighting times without sacrificing on my decor. My apartment isn’t much, but I do have it nicely decorated, with my living room in shades of blue, and I wanted a craft to reflect the decor and match the room. But I didn’t really have a specific idea in mind, so I pushed it to the back burner. While on vacation in Virginia, the answer to my dilemma fell into my lap. I was in Target’s Dollar Spot and came across this large, kitschy chalkboard plaque, complete with a hanging string. 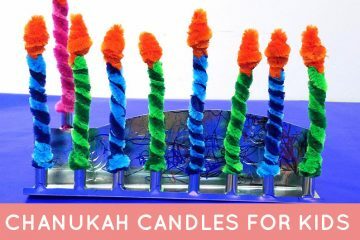 I instantly knew this was what I wanted to create my Shabbat candle-lighting sign with. The best part is the chalkboard finish- it makes it super easy to erase and fill in the new times every week. 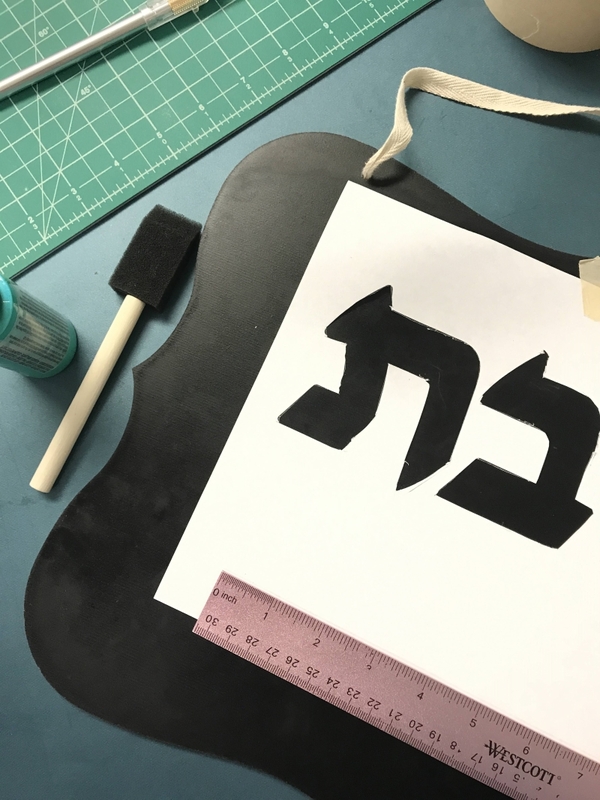 In order to simplify this craft as much as possible, I created a template (download below) to cut out and paint in on your chalkboard plaque. No guessing size or whether or not your letters are properly spaced. 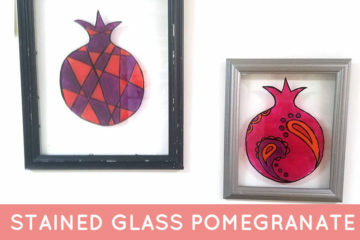 Just print, cut and get to crafting! hanging chalkboard plaque; I got mine for three dollars at the Dollar Spot in Target, but you can use any kind you’d like. Mine measures approximately 11″x14″. acrylic paint; I used an aqua color shifting metallic paint for the letters, and gold acrylic paint for the candlesticks. How to download it for free: Just enter $0 in the price field. 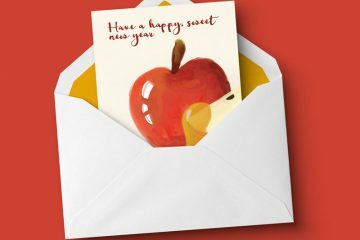 You’re welcome to enter more – as of now, any optional donations are going directly to help us pay hosting and other running costs. 1. 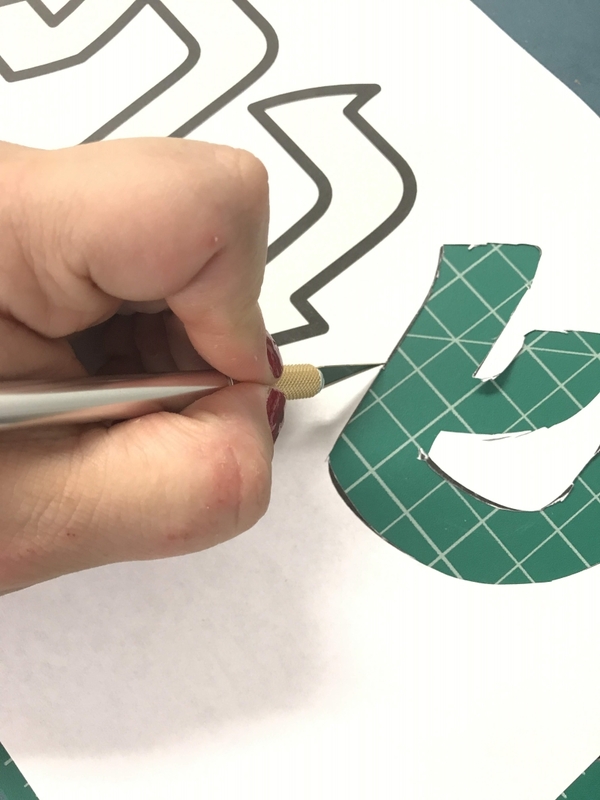 Using your craft knife and cutting mat, carefully cut out the letters and candlesticks from the template, making sure that the rest of the page stays intact. Do this slowly to ensure you don’t tear the paper. I printed and cut using regular paper, but if you’d like something sturdier, you can use cardstock. 2. When your template is properly cut, measure the center of the chalkboard plaque, and mark it with a pencil. 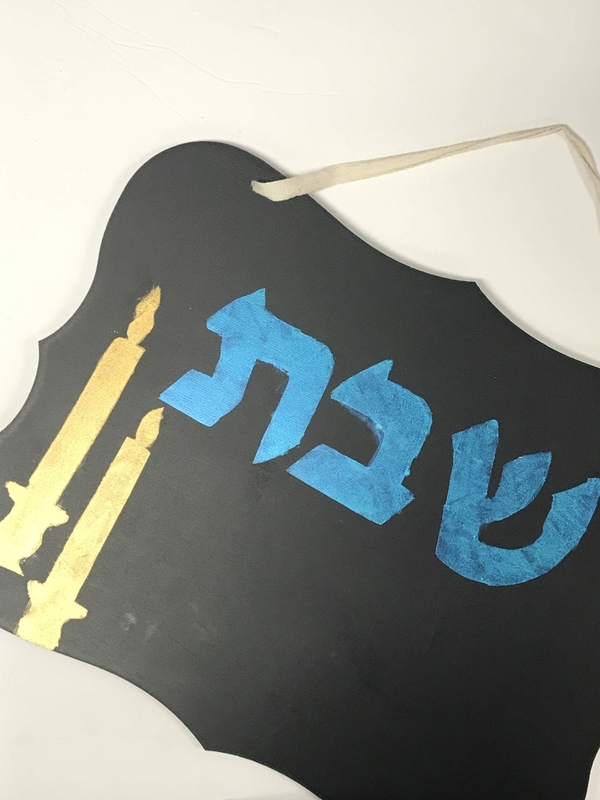 Measure one third of the way down from the top of the plaque and position the שבת template in the top center of the plaque. 3. Lightly tape the template in place on the chalkboard plaque. 4. 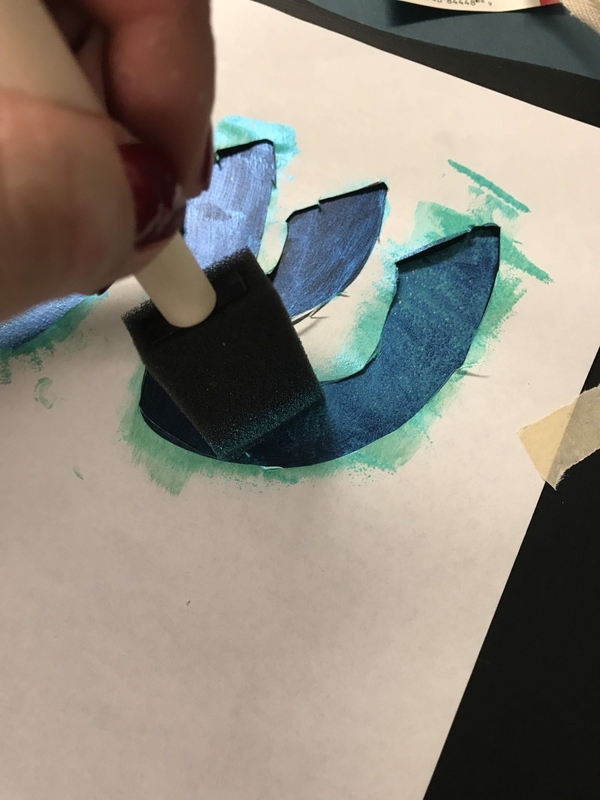 Pour a little paint on a plastic paint or palette, and, using your foam brush, lightly paint the inside of the letters. 5. Allow to dry for a few minutes and repeat with a second coat of paint. 6. 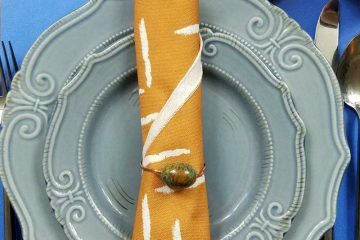 Allow to dry for a few minutes and repeat with a third coat of paint. 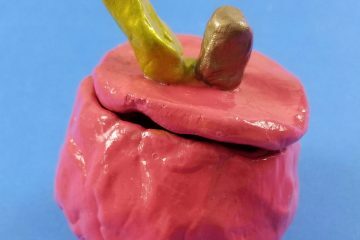 If you are using a color shifting metallic paint, like I did, you can try to bring out more of the color and texture by dabbing the third coat on instead of stroking it. 7. Allow to dry for at least one hour then remove the template. 8. 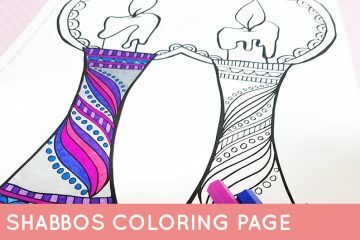 Position the cut-out candlesticks template on the lower left of the plaque, one slightly taller than the other. 9. Lightly tape the template in place on the chalkboard plaque. 10. Paint the candlesticks in the same manner as the letters and allow to dry fully. 11. 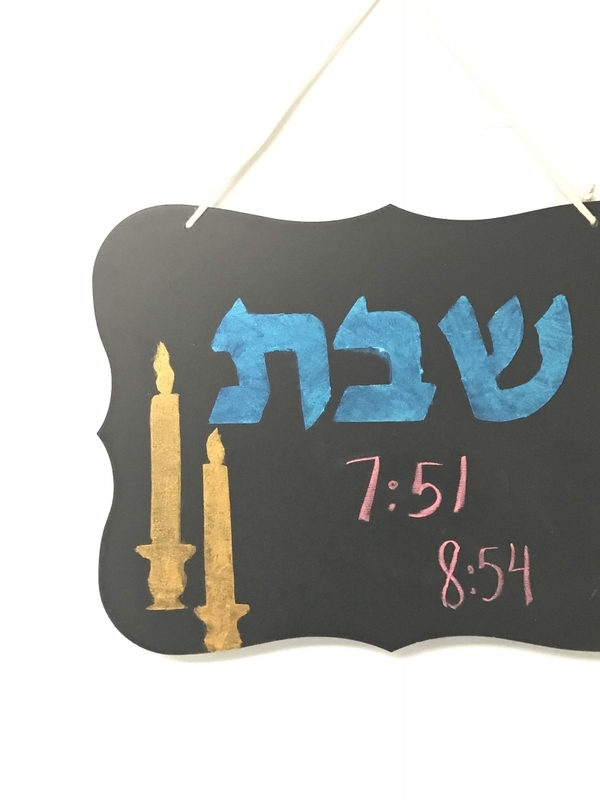 Write out what time Shabbat starts and ends this week with chalk and hang your Shabbat Candle-Lighting Sign in a visible spot! 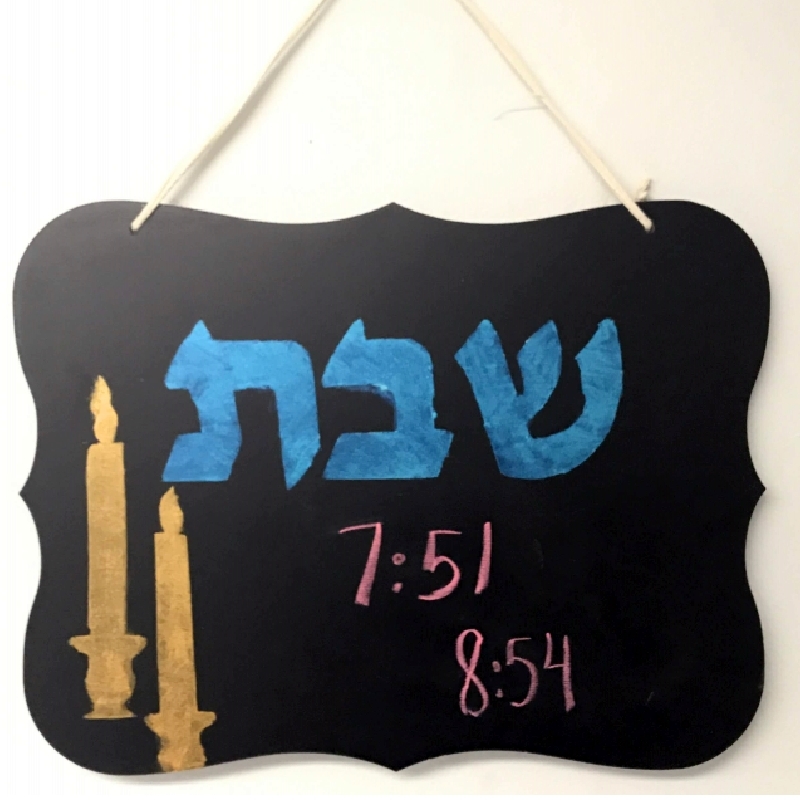 How will you personalize this Shabbat Candle-Lighting Sign to make it your own? Comment below!